Once again we awake to a fresh covering of Snow up here on the Yorkshire Moor top. I thought It would be a good idea to take at look at the Weather(WX) for myself with the help of Earth Orbiting NOAA-17. 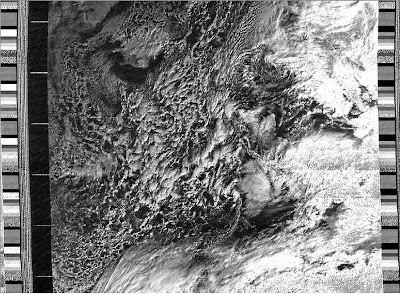 The NOAA-17 Satellite is in continuous orbit with an altitude at around 500 miles and produces excellent real time images of the Earth that can be received around 137.620 MHz APT (Automatic Picture Transmission) or 1707.00MHz HRPT (High Resolution Picture Transmission). Once the Satellite came into range (from the North) I was able to receive the signal using the FT-847 and IO-10EL Sat Antenna. The received signal was decoded with the computer using Radiocom 5.2(RC50) which can be seen in the image below. 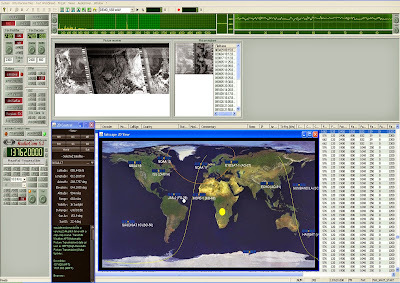 I've been decoding the NOAA Weather Satellites for over 5 years using the RC50 software with excellent results which can be found in my archive posts. The images allow you to make up your own mind up regarding what the WX will be doing, as data can be collected during each of the many NOAA Satellite passes. Looking at his one, I think I will be wrapping up warm and reaching for my boots before stepping out. Stay warm!